Breaking News! 2 Challenges in 1!! Hi Everyone!! I hope you had an amazing Holiday season. Are you ready for the new year? We here on the House of Gilli Design Team are gearing up for the new year and some great new challenges! We have decided to combine our Red and Gold Challenge and the new Blue and Sparkly challenge. What does this mean for you? Your project can fit either of these themes and be entered for a chance to win a great Gilli Goodie!! This combined challenge will run until 10pm eastern time on Sunday, January 1, 2012. You have until then to enter your project (or projects) into the Inlinkz below! Have a happy and safe New Year and we look forward to seeing your great projects!! Andi here and it is time to start our newest challenge- let's make it blue and sparkly! 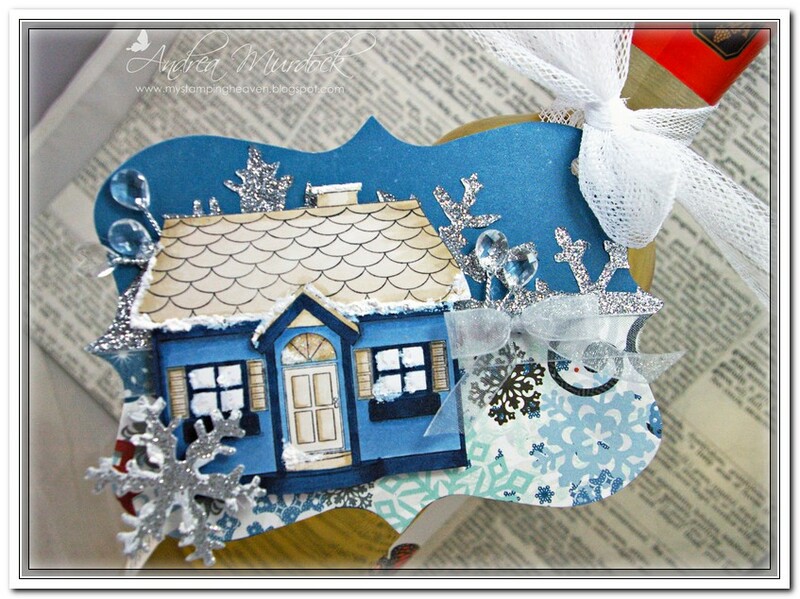 I made a gift tag this time using the Gilli House stamp and some of the new Echo Park Winter papers. I also added bling anywhere I could including in my die cuts. I wanted to get a snow feel to my tag so I added some 'Snow Tex' to my tag to give it a frosty look. I used my copics in the B90's for my blues and E40's for my cream elements on my home. What does this challenge inspire you to make that is blue and sparkly all over? We can't wait to see! Play along and maybe it is your turn to win some lovely Gilli goodies to play with. Balloon GILLI - Red and Gold ! my Red and Gold Challenge here at the House of GILLI ! I've chosen the Balloon GILLI Stamp for this Desk Calendar. for further details you can visit my blog ! Happy Thursday everyone. Our Red and old challenge is still going on and I hope you will join in. For my card, I decided to use Parisian Gilli and she is such a cutie. I colored her with Copics and I was so happy to find some really great DP to coordinate with the Red and Gold colors :) Hope you will join in on this wonderful challenge, we already have some beautiful entries. Hi! 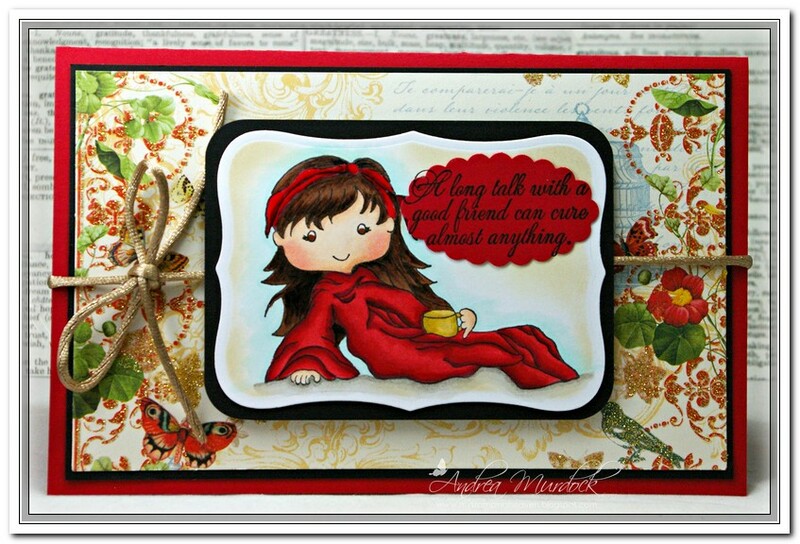 Andi here today with your Red and Gold inspiration for our current challenge hosted by Ann. I used my fave Gilli- Cozy Gilli- for the current challenge as I was feeling a bit under the weather when I was crafting and seeing her with her Snuggi on and her warm cup of tea made me want to be her lol! So she was perfect to get me to forget about my own sicky ickies and colour happily away. I hope you get a chance to craft today as well and if you can play along with us- you don't have to use a Gilli stamp but you get extra points if you do! So dig out that Red and Gold and get crafty!! Hi Everyone! 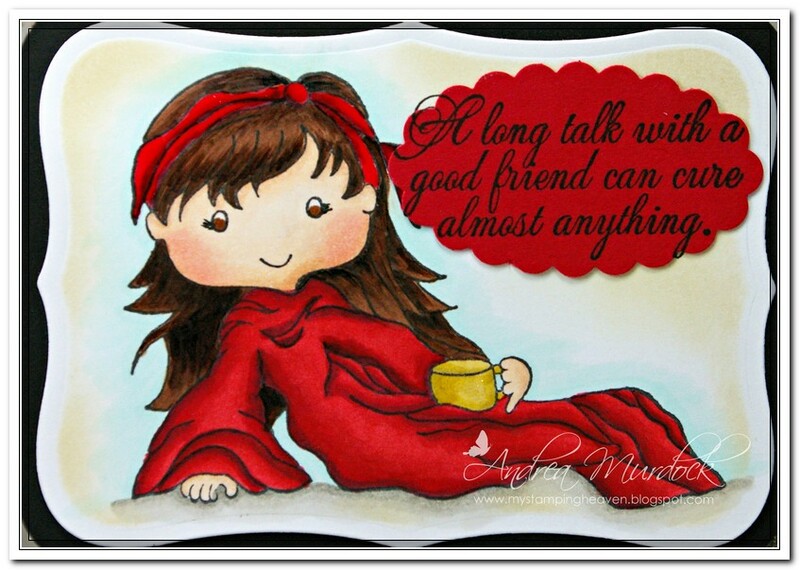 It’s Wini from LooneyBugDesigns with your Red and Gold inspiration project today. I choose Stole Gilli to showcase in red today. I love how elegant she is. It didn’t show up well in the picture but the cord is gold cord also. I used a Gold Copic Spica pen to color her purse and shoes because we all need to have a little bling on our matching accessories, right? I can’t wait to see what you create for our red and gold challenge! Don’t forget to enter your project in the in Inlinkz at the bottom of the page. Here is Vivi with Stroll Gilli for the Red and Gold Challenge! I colored my Gilli using copic markers: R46, R29, R27, R24, R20, YR24, YR23, YR21, C9, C7, C5, C3, E11, E00. Dont forget, you need to use memento ink pak with your copic markers so it wont bleed and ruin your image! The gold paper I used is from a gift bag from a present that I received yesterday, I add it on a white cardstock so it would be thicker and then used my Martha Stewart heart punch on the border. Cardstock, ribbon, rhinestones are from my stash. Sentiment is from Stamping Up! and Flowers are from Prima. I used red ink pad with my Tim Hotlz felt applicator all around the Gilli. 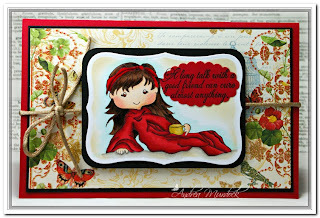 I hope you like my card and come on over to play with us in a chance to win a bag of Goodies from Anary!! Thanks for stopping by today and have a Great Sunday! Well Gilli sure is. She has been making her rounds at all the holiday parades. She choose her red and gold outfit to do those dance numbers in. It’s Jo I am back filling in for Dionne here at The House of Gilli. 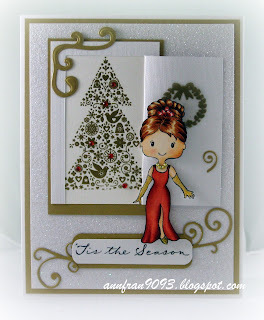 I had a blast making this card for the Red and Gold challenge. I knew going into it I wanted to make her skirt gold and give it some glitz. She is colored with Copics. I added crystal stickles to her skirt and glaze pen to her boots. The holly and berries on her hat are some confetti I have in a big collection of confetti I have. The lollipops and Merry Christmas are confetti as well. My papers that I have used are from Imaginisce Cottage Christmas Collection. I hope that you will join in on the challenge. It is a fun one. Just think of all the different things you can do with the colors Red and Gold. My Copic combo for gold in case anyone would like to try is YR31,Y26,YR23,Y28. I also want to thank anaRy for inviting me to help out. It has been really fun. Happy Holidays from Lady Gilli!!! at the House of GILLI ! and recycled a chocolate box !